These words were apparently rather newsworthy considering the number of headlines they generated — not that anyone was waiting with bated breath in hopes that Flake would further upset the apple cart by attempting to primary out the president in 2020. In fact, it is hardly presumptuous to assume that not one conservative was on the edge of their seat preparing to give a standing ovation the contrarian senator that nearly killed then-Judge Brett Kavanaugh’s Supreme Court confirmation for the sake of appearing likable should he announce his candidacy. Flake’s nauseating misstep during the Kavanaugh confirmation coupled with his incessant need to constantly grandstand against the president not only smothered any hopes he had of ever being the Republican standard-bearer, it had many on the right calling for his unofficial excommunication from the party. And as his successor was being chosen last year, OH Predictive Insights/ABC15 polling indicated that just 38 percent of Arizona’s likely voters viewed Flake favorably in early October. By election day, Flake’s favorability was found to be even worse when CNN exit polling revealed it to be at an abysmal 26 percent with disapproval as high as 68 percent. With numbers like those, Flake would have been lucky to be elected to a seat on the Mesa Public Schools Governing Board last November. But if Flake’s time in office was not enough to do it, his seemingly innocuous statements Tuesday should entirely flatline his favorability among conservatives. 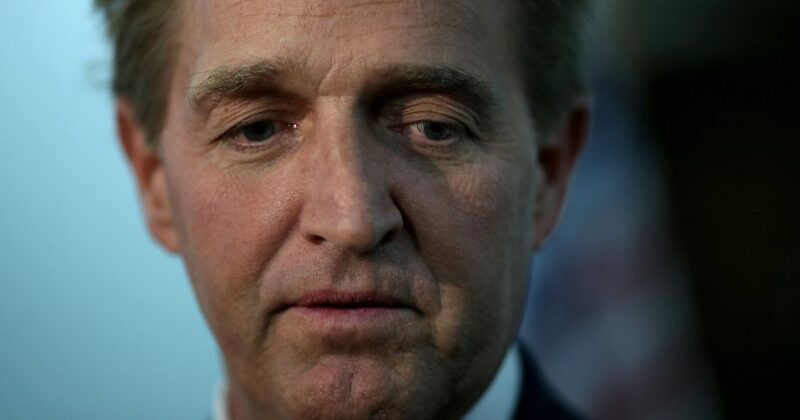 When Sen. Flake hijacked the title to Goldwater’s historically influential “Conscience of a Conservative” in 2017 for his 160-page anti-Trump manifesto, he had earned a collective eye-roll and conservative America’s disappointment. When he tossed aside notions of decency, due process and constitutional service to throw the liberal left a bone during the Kavanaugh hearings, he earned no small bit of our scorn. Still, Flake’s behavior, however disappointing or controversial, seemed to be grounded in the preservation of his personal rationale, principles and conscience, and a man should always ground himself firmly in those things despite the backlash it may cause. Thus, the man retained my respect. Flake’s unwillingness to primary Trump after all the grandstanding he has done, however, reveals him to be a man entirely undeserving of conservative America’s respect. Flake is just another profile in cowardice. And his statements Tuesday earned him a place in bad company — in the unofficial and disreputable club for those who profess to hold the strongest of convictions while lacking anything that remotely resembles courage. Unfortunately for us, that club is growing with each passing month and it is littered with practiced establishment politicians like Sen. Mitt Romney and former Gov. John Kasich. Unfortunately for them, their modus operandi is embarrassingly transparent. They maintain relevance by attacking fellow Republicans with whom they disagree — printing hit-pieces and signing on as analysts with liberal outlets like The Washington Post and CNN — all while singing the praises of their own superior conservative principles and convictions. Yet, when asked if they would be willing to take on Trump in defense of those principles and convictions, they deflect. Not only did it epitomize spinelessness, it perfectly exemplified everything that is wrong with this collection of individuals — they want to throw haymakers and cheap shots at Trump in front of the press, but they will never agree to take him on face-to-face. They all believe that Trump is the wrong man for the job — that he is irreparably damaging traditional conservatism — but when the time comes to pony up and face him themselves, it is always someone else’s turn. The optics of it all are horrifying. The Republican establishment is now openly and intrepidly engaging in displays of the same smug, hypocritical behavior that had them tarring and feathering people like the Clintons and Obamas for nearly three decades. Worse still is the fact that these are men who believe, and carry themselves, as though they are the heirs to the Goldwater and Reagan movements. The difference between this ever-growing collection of cowards and Goldwater, however, is that he stepped into the ring despite the dangers and uncertainties of an uphill primary. Goldwater walked with head held high as he battled Nelson Rockefeller for the soul of the party in the 1960s. While President Lyndon Johnson’s liberal Democrat complex ruthlessly assaulted his character and morals, Goldwater was unwavering in defense of his Conservative Ideal. Goldwater was not simply a man of great conviction — he was a man with the courage of his convictions. Reasonable conservatives can differ on what liberty and justice mean to them or what the Conservative Ideal is. They can have different visions on what exactly traditional conservatism is and how best to employ it in governance. But a principled conservative cannot rest in good conscience knowing that they have let moderation or self-preservation stop them from defending their version of the Conservative Ideal. A principled conservative goes down fighting. Jeff Flake and his ilk never will.